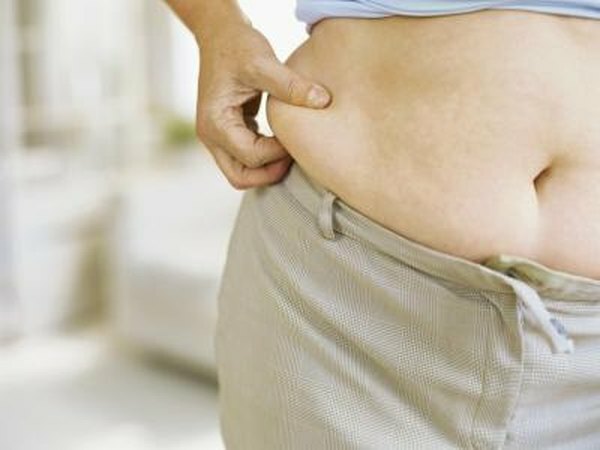 What Causes Hard Belly Fat? Belly fat may be more than unsightly or embarrassing. Harvard Medical School notes that excess weight in the midsection -- particularly the visceral fat that lies below the surface and surrounds organs in the abdomen -- can increase your risk of contracting type-2 diabetes, heart disease, high blood pressure and breast cancer. Adopting new lifestyle and exercise habits can cut your risk and reduce your belly bulge. Increasing your amount of daily physical activity can help reduce belly fat. Your tummy might be the first place on your body that you’ll start to see improvement when you shed pounds and tone muscles. Harvard Medical School suggests doing cardio for at least 30 to 60 minutes every day and incorporating strength training on two days. Spot exercises that target your tummy can give your belly a more toned appearance. For the lower abdominal muscles, try pulling your navel in toward your back as you exhale. Hold the contraction for 10 seconds while you breathe as normal, and then relax. You can also try pelvic lifts and sit-ups to strengthen stomach muscles and flatten your midsection. Skipping meals and drastically cutting calories can slow your metabolism and trigger an increase in belly fat. Harvard Medical School notes that crash diets may make your body believe it’s starving and lead it to store fat to survive. If you’re hoping to lose weight, the publication recommends reducing portion sizes, eating lean proteins and complex carbohydrates and choosing foods with trans fats instead of saturated fats. Habits that negatively affect your health can lead to an increase in belly fat and visceral fat, according to Harvard Medical School. Smoking, for example, can lead your body to store more fat in your stomach instead of storing it in your thighs and hips. Getting less than five hours of sleep each night and feeling stressed can also increase visceral fat, because excess cortisol -- a stress hormone -- can cause an accumulation of visceral fat. Emotional factors can be a possible cause of excess belly fat. A study by the University of Alabama at Birmingham showed that individuals suffering from depression gained more weight faster than those who didn’t suffer from the affliction. The possible cause of their abdominal obesity was the hormone cortisol. If you believe depression is a reason for excess weight in your midsection, talk to a counselor, physician or mental health professional for appropriate treatment.